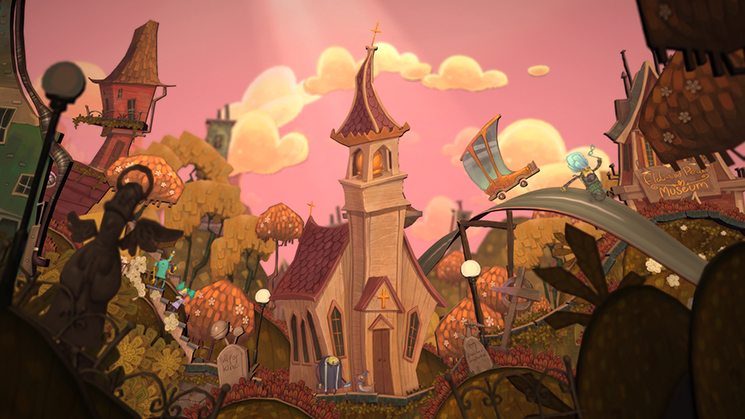 Zoink Games has announced the release date for comedy adventure game Flipping Death. Flipping Death will be ready to purchase on August 7, 2018 via the Switch eShop in North America and Europe. The game is also receiving a physical release later this year. Yep, you heard me! Flipping Death arrives at your digital doorstep in less than a week. On August 7th, it’s your job to use the powers of your ghastly scythe to possess humans, aid ghosts, and solve mysteries in the town of Flatwood Peaks. Starting next Tuesday, owners of Nintendo Switch, PlayStation 4, Xbox One, and PC alike will be able to take on the not-always-so-easy job of temping as Death in the comedy adventure game Flipping Death. You’ll leap between platforms, solve puzzles, and help the dead rest in peace by possessing the living and making them dance around at your merest whim. The problems of the dead are brought life through the hilarious writing of Eisner award-winning Ryan North and a wonderful cast of voice actors. Us at Zoink Games have been working hard on Flipping Death for years and we’re sooo ready to unleash it to the world of the living. We’re confident that you’ll love it as much as we are!